I recently posted a pic of these guys in a post about things (food) I've made and had a few inquiries so I figured I actually post the recipe (and in a timely manner at that - go me!). I originally had the idea to make these because mini-me LOVES pasta but I wanted something in an individual portion and that I could freeze. These turned out great, thawed and heated well and were a total hit with mini-me (I may have had a few myself - they're quite good!). Preheat oven to 350 degrees (175 C). 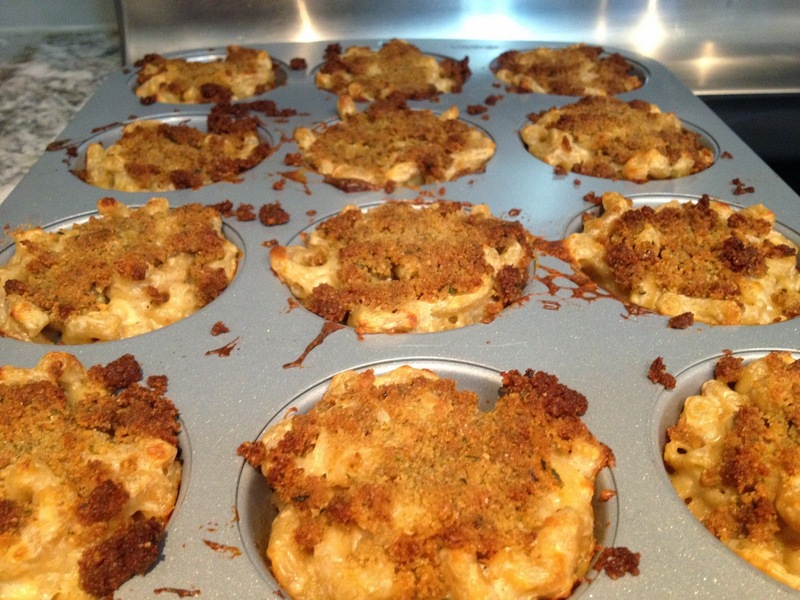 Grease muffin tin with a little olive oil (you could use butter for this if you prefer). Cook noodles as per package instructions (don't overcook). Melt 2 tablespoons of butter in a small saucepan over medium heat. Still in the flour and mix well (I used a metal whisk). Then pour in milk and stir constantly until mixture comes to a boil. Remove from heat. Add egg to milk/butter mixture and stir well. Add in cheese and cooked pasta. In a small box mix bread crumbs, 1 tablespoon of butter and salt. 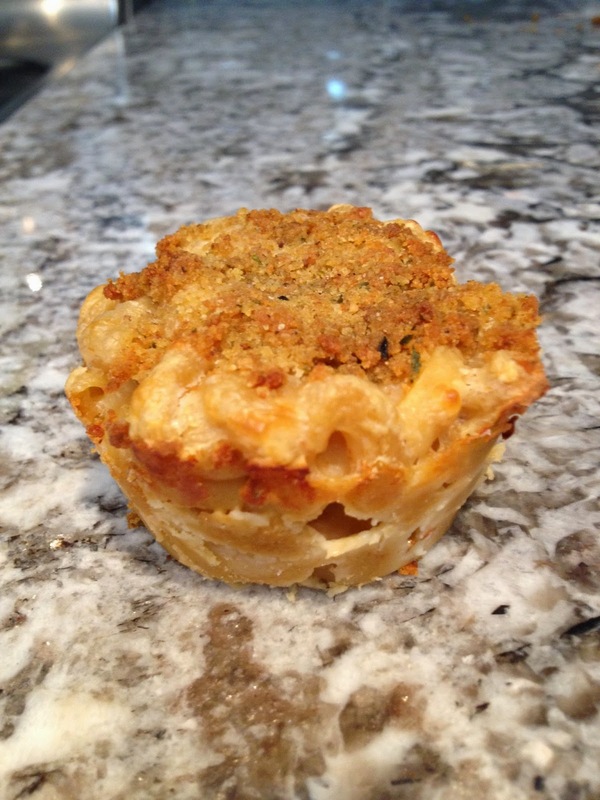 Spoon mac and cheese into prepared muffin tin. Sprinkle bread crumb mixture over the top (you could save some shredded cheese to go on there as well - no one ever complains about too much cheese). Bake for 30 min in preheated oven or until tops are lightly browned. Allow muffins to cool prior to removing from pan. To freeze: allow muffins to cool completely and transfer to freezer-safe container (or use zip-lock freezer bags). To thaw: remove from freezer, thaw in fridge. Heat (I used the microwave but oven would work too). Variations: BACON!! You could chop up and pre-cook some bacon to add (or sprinkle the tops with real bacon bits). I suspect Mr. B would be a HUGE fan of this variation. Cream cheese: I LOVE cream cheese - I suspect it would be a delicious and creamy addition but might require some additional flour (so that mix gets thick enough and still keeps shape). OMG those look yum!! Thanks for the recipe! 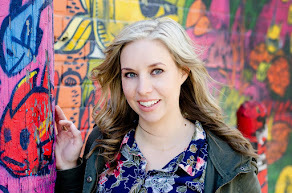 Hope you are feeling well- xo! I was actually thinking of texting you on Saturday and asking for the recipe for this....yaya! Thanks for sharing the recipe! I'm making these this week! 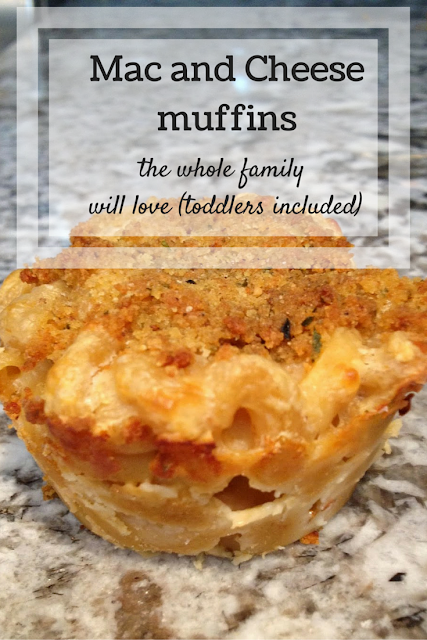 Great recipe...my kids will definitely enjoy this, since they are macaroni and cheese lovers! they are most definitely kid friendly! So excited you posted this. Making them for sure! Oh, these look insanely good! I love Mac and Cheese and I know my kids would LOVE these!!! not exactly health conscious, BUT a treat every now and then is good!